Full issue online at Sage for 30 days, free. 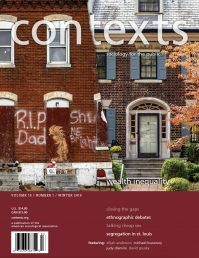 As we add articles to contexts.org, those pieces will be sorted to the issue’s homepage: https://contexts.org/issues/winter-2018/. New editors Rashawn Ray and Fabio Rojas put out the call to send us your sociological gold. Six essays by Wanda Rushing, James M. Thomas, Victor Ray, Dawn M. Dow, Milton Vickerman, and Eduardo Bonilla-Silva explore Americans’ construction and deconstruction of collective memory as white supremacists take to the streets. Originally published as contributions to two symposia, After Charlottesville and After Charlottesville, Part II. Trump’s political breakthrough fits a larger american pattern, from andrew jackson to the present, recalling red scares, racial wars, and fears of foreign subversion and terrorism. 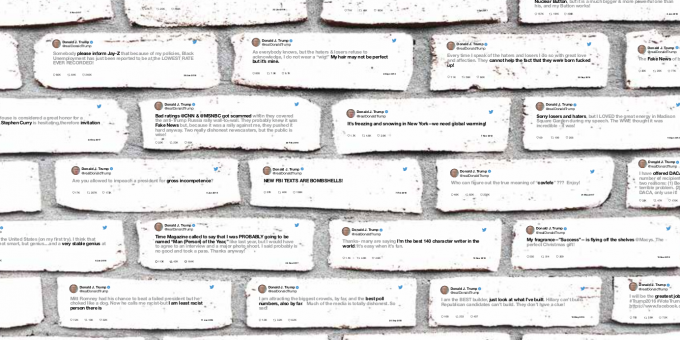 A look at the trump administration’s attacks on mexicans, muslims, and unauthorized immigrants and how they’ve undermined longstanding policy and public perception. From the Women’s March to Unite the Right, the Trump presidency has gotten underway during an extraordinary period of mobilized american protest. If men can respond to masculinity threat by refusing to do the dishes, doing push-ups, or going to a more fundamentalist church, why not by espousing certain political views or favoring certain candidates? Today, affirmative action’s greatest power comes in its deployment as an extremely efficient rhetorical tool for mobilizing white resistance to racial equity. As with so many technologies, the internet’s racism was programmed right in—and it’s fueled the spread of white supremacist, xenophobic rhetoric throughout the western world. Empathy Gaps, Women’s Work and Leisure, Gun Shops and Big Data: New research from the journals. Why Clinton Lost, An Interview with Melissa Harris-Perry. Hana Brown and Melissa Harris-Perry write about and discuss the 2016 election. Genuine Anger, Genuinely Misplaced. Contexts’ editors interview Arlie Hochschild about revisiting respondents post-election. Protest posters as a flexible, class-free mechanism of expression. Louise Seamster on Lower Ed. Jacob Rugh on Race and the Politics of Deception. Amin Ghaziani and Ryan Stillwagon on temporary spaces of queer community-building. Bianca Gonzales-Sobrino on post-maria restructuring, from electricity to citizenship. Emmanuel David on artist Cassils. Tristan Bridges and Mignon R. Moore on race, gender, and identity. Raphael Charron-Chénier and Louise Seamster on debt and social inequality. Do Black Lives Increasingly Matter? Christopher Todd Beer on trends in police killings. Paula M. Lantz on the evidence around a popular “pup” law. Jessica Cobb on teaching—and learning from—a uniquely diverse cadre of college students.